Do you want to encourage children to read the Bible? Do you want children to realise that the Bible is God's guide for them, relevant, exciting, dynamic! TnT Ministries have developed 'On The Way' to meet your needs for teaching the children. These books are especially relevant to 9-11 year olds. This is book 2 (of 6) and covers 'Life in Bible Times' and 'Investigating The Truth'. It doesn't matter if you are teaching in a church, community hall, or sports complex the material is flexible enough to suit a wide variety of situations. You photocopy the number of activity pages you need ñ so there is only one book to buy. Every lesson, in addition to an aim, has study notes to enable the teacher to understand the Bible passage, suggested visual aids where appropriate and an activity for the children to take home. Because of the emphasis on teaching basic Bible study skills many of the activities take the form of a work-sheet. These provide opportunity for applying the lessons learnt.. Many of the lessons also include a craft activity. Thalia & Trevor Blundell are head of TNT Ministries (which stands for Teaching & Training). Launched in 1993 by an interdenominational group, they have developed a range of Biblical teaching materials and run training days for Sunday School Teachers. This 14 book series takes three age ranges through the Bible in 3 years. Comprehensive, edited by David Jackman and containing everything you need for your lessons in each book. Each lesson has 3 age relevant activites that are reproducible, as well as bible study notes to help the teachers prepare the lesson. 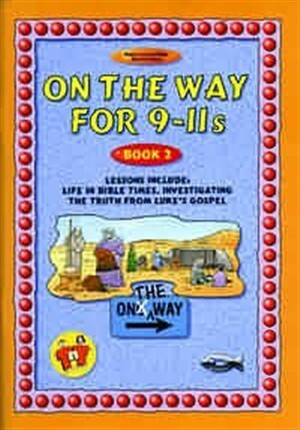 On the Way: 9-11s : Book 2 by T Blundell was published by Christian Focus Publications in September 2000 and is our 3914th best seller. The ISBN for On the Way: 9-11s : Book 2 is 9781857925524. Be the first to review On the Way: 9-11s : Book 2! Got a question? No problem! Just click here to ask us about On the Way: 9-11s : Book 2.